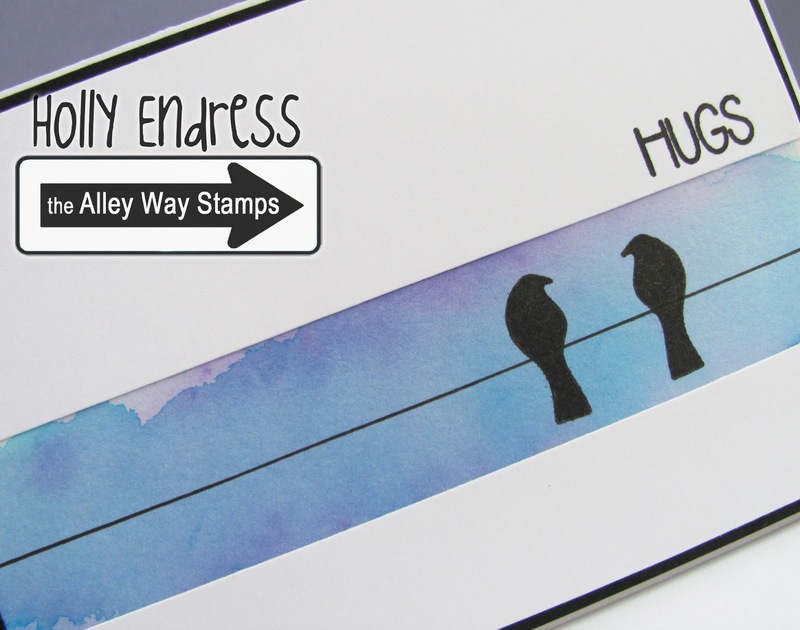 It's Saturday and time for more fun with the Alley Way Stamps.. today I have a CAS card with a watercolor wash background. I created a watercolor wash onto a piece of Mixed Media paper and then once it dired I trimmed it down to a A4 size card.. 3.75 x 4 7/8. Then I stamped the 2 birds from the set Branching Out in VersaFine Black ink and then using a Copic Multi liner I drew the wire. CAS is not my thing so this was tricky for me to leave it as it and not add more stuff to it. I created a white card base and then I added the watercolor piece to a black layer and added it to the card base with some dimensional adhesive. I cut 2 additional pieces of white card stock to created an opening for the watercolor area to peek through. I stamped the Hugs from the Moosing You set (Free all month with a $40 order). Then I added the 2 pieces over the watercolor piece. Head over to the Alley Way stamps blog to see more great projects from the Design Team using this month's fun release sets.